Many of your friends and neighbors are already shopping at Smile.Amazon.com and benefitting the charitable organization, Camas Prairie Food Bank, whenever they make qualified purchases at Amazon. Every little bit counts. We feel the love. Askers Harvest Foods in Grangeville ID helps community to give back. Lots of community efforts going on these days in Grangeville Idaho, and its high time we highlight some of the good deeds being performed among businesses, churches, clubs, organizations and citizens. I'll update this list of other recent endeavors by our community as a sign of Thankfulness and Support for those in need. In Grangeville, any efforts to help supply the Camas Prairie Food Bank is considered a gesture of "Neighbors Helping Neighbors". Annually: Cash n Carry - lots of effort and support too many to mention, including emergency turkey deliveries. November 8th - Centennial Library Drama Club - Collected canned goods and perishable items for food bank. November 23rd - Grangeville Christian Church - Gail Stowers said: My church (Christian Church), had our annual Dean Cox memorial food drive last Sunday. Donated 1,980 pounds and $$'s for over 200 turkeys. Yipee! November 21st - The Gallery - Fundraiser with music and dinner in a stylish atmosphere. November - Boy Scouts and Girl Scouts - Food collection drives. Annually - Basketball playoff sponsored by Idaho County Sheriffs Dept brings in lots of canned goods. November - People First - Donation of funds. November - MTIDA.net Generously donated internet services and wifi inside food bank building which is TOTALLY awesome for conducting business at the food bank instead of at home where Carlene and other volunteers have plenty of other obligations. Thanks Bruce, Stacy and Greg! Shelves Are Sparse For The Holiday Season. Help Make A Difference For Struggling Families. 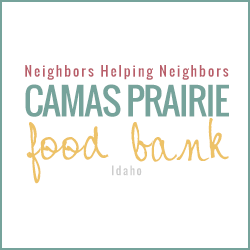 On behalf of Camas Prairie Food Bank, thank you for your continued support. Our community clubs and organizations are taking steps to support homeless families and struggling neighbors by adding food donor and collection efforts to their activities programs. Our shelves are quite sparse though, and so we must continue efforts to combine all efforts to make a difference in the lives of families who are going through a rough spot and struggling with the high costs of food. Children and those enrolled in school, suffer the most by not having a stable diet of nutritious foods to fuel their brain and body. Whatever you can do to supplement the food bank, even if its just a can or 2 of food, drop it by the Food Bank in the wood box at the back of the food bank house. Every little bit helps. Giving Assistant makes it easy to donate to Camas Prairie Food Bank! Simply shop online, earn cash back, and donate as much as 30% of your purchase price—Giving Assistant facilitates the whole process. Now, you can help change the world for free while saving money at over 1700 popular online retailers like Home Depot, Walmart, and JC Penney! Charitable Donations Are Always Appreciated! Grangeville Community Garden has a FACEBOOK FAN PAGE. Do know someone who might benefit from Camas Prairie Food Bank? Want to chime in on this website? We're all for improvements and the evolution of this site will rely largely on input from citizens like you. Please use our comment form below if you have suggestions or comments. We appreciate your feedback. Copyright Wild Web West, LLC All Rights Reserved. Simple theme. Powered by Blogger.